The four minute mile was an elusive ambition in the field of athletics. It had been a target for many years but has never been recorded formally. 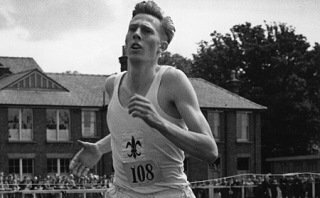 Then one day in 1954 a young man by the name of Roger Gilbert Bannister was the first person to cross this important barrier. It was a symbol of humanity’s ability to improve upon itself and he was there first. For years it had been thought an impossible barrier. 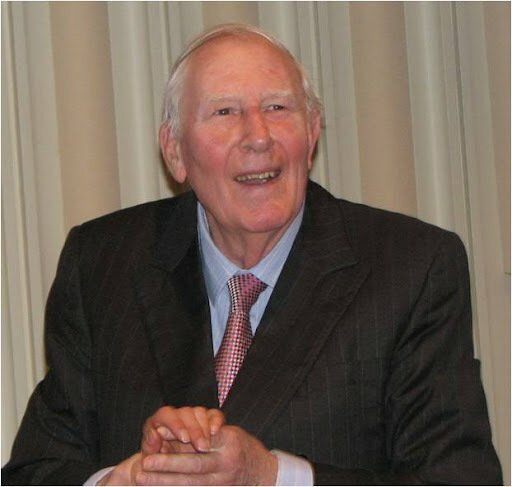 Roger Bannister was born in 1929 (and is still going strong to this day) in Harrow, a small town outside of London famous for its private boy’s school. Bannister, however went to City of Bath Boys’ School before going on to study at University at Oxford University, followed by a tenure at St Mary’s Hospital Medical School which now forms part of Imperial in London. Like many British gentleman of his day, Bannister’s start in the world of athletics was decidedly amateur – and this is not meant in a derogatory way, At 17 he had gone down to Oxford, a promising medical career lying ahead of him. Running was a serious hobby – so the young Bannister had for example never worn running spikes before that time or indeed run on a track. Even by the standards of 1946 his training was light. Yet he showed an enormous amount of promise and the following year he ran a mile in 4:26:6. This was with just a half hour training session three times a week. The British Olympics Committee was certainly impressed and he was selected as a possible in 1948. The still teenage Bannister graciously declined. He felt that he was not ready for the Olympics, choosing instead to watch them. Over the next few years he steadily improved his timing at both the mile and the 800m (run in European Championships where a defeat in 1950 spurred him on to train much more vigorously than ever before). His reputation of invincibility grew (mostly at home in the UK, of course) but this came crashing down in the European Championships at Belgrade in 1951 on 25 August, He lost to the Yugoslav Andrija Otenhajmer – at 3:48:4 in the 1500m. It was only 1:4 behind the other runner but it was, nevertheless, a blow. 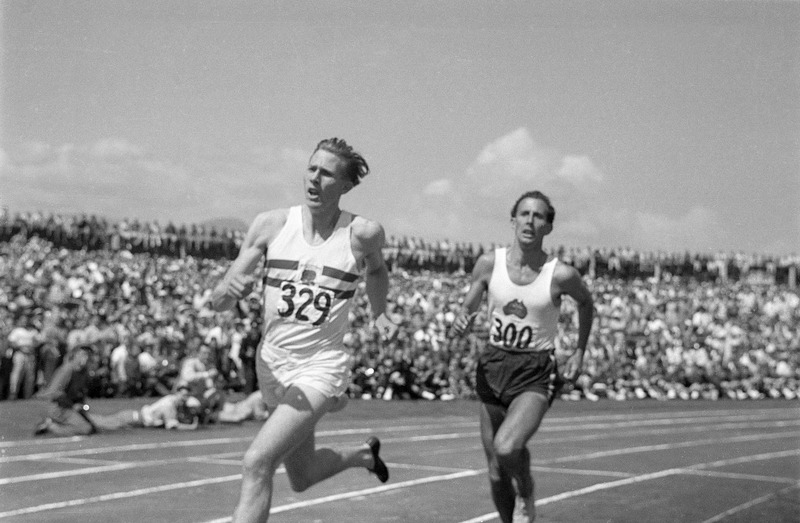 The 1952 Olympics saw a further blow where he came fourth in the 1500m final. Yet hope remained – he had at least set a British record of 3:46.30 (3:46.0) in the process. 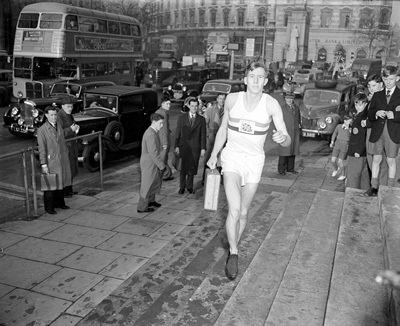 Bannister spent several months dwelling on his defeat and deciding whether to stay with running or to give it up entirely. He eventually shrugged off the idea of throwing in the towel and instead set himself a new target – to be the first man to run a mile under four minutes. He trained incredibly hard and in 1953 he made an attempt at the British record, previously held by Sydney Wooderson at 4:04.2 who had created the record eight years previously. Bannister came in at 4:03:6 – shattering the record and instilling a new hope in himself – he knew now that the four-minute mile was not out of reach. It was not as if he didn’t have competition. Other runners had their eye on the prize too. The American Wes Santee came close on 5 June 1953 with a time of 4:02:4. Then there was the Australian John Landy who ran 4:02:0 in December of the same year. He followed this up with several new attempts in the early months of 1954 but narrowly failed to better his time. Bannister had nervously followed his Australian rival, convinced that at each attempt the four-minute mile would be broken. At the end of the Australian season in April Bannister knew that he had a short window of opportunity – his own attempt at the record had to come soon. The date was chosen. 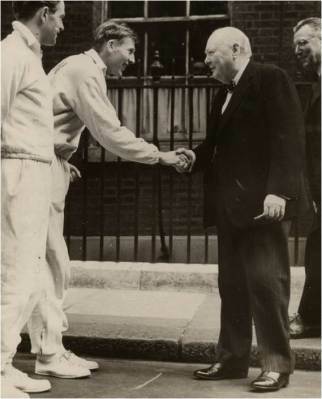 It would be 6 May 1954 at a meet between the British AAA and Oxford University. The Iffley Road Track in Oxford was duly prepared and 3,000 spectators turned up in anticipation. Yet the day turned out to be windswept – a 25 mile per hour wind was blowing around the track. Bannister all but pulled out but then, just before the race was due to start the winds – as if by divine ordinance, dropped. The race would go ahead. Brasher and Chataway, running colleague had already agreed to provide the pacing for Bannister. Harold Abrahams (immortalised by his own career and the film Chariots of Fire) was there to do the commentary for the BBC Radio. Norris McWhirter who would later in his life edit and publish The Guiness Book of Records with his twin brother Ross was the stadium announcer. It was an all star cast, as it were. McWhirter was something of a showman. Once the race was run he teased the audience with a long preamble to the hotly anticipated result. There was no point at the stage in continuing. 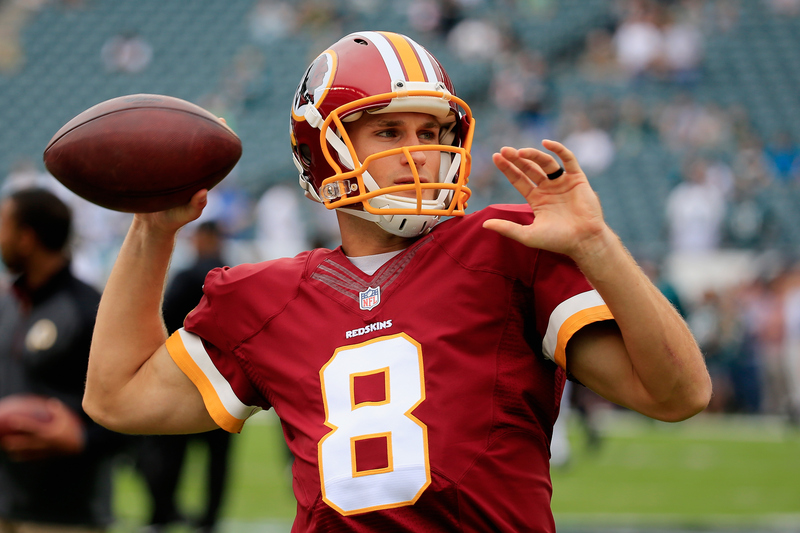 As soon as the stadium heard the magic word – 3 – it erupted with a deafening roar of triumph. 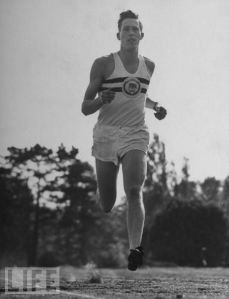 Bannister’s time was 3:59.04 and it was indeed a new World Record. Of course this spurred on athletes all over the globe and it was less than two months later (46 days to be precise) that Bannister’s own record was broken. This time it was his rival, the Australian John Landy who ran 3:57:9 in Finland. 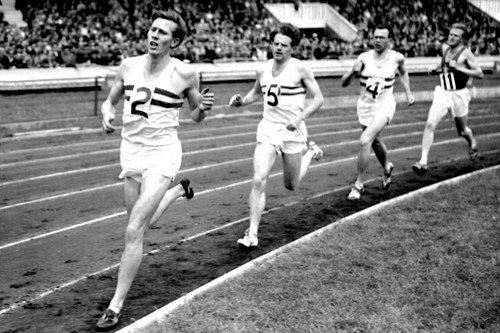 Bannister and Landy were to finally compete against each other, post record, on 7 August 1954 at the Commonwealth Games in Canada. Bannister won this epic clash of the titans, coming in at 3:58:8 with Landy less than a second behind him. 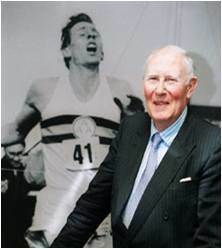 Roger Bannister went on to gain a European Championship record for the metic mile (the 1500m) at Bern on 29 August – his time there was 3:43:8. If it was today, Bannister would have been made for life with sponsorship deals and so on. However, for athletes 1954 was another world – if not universe and these options were simply unthought-of at that point. After Bern, Roger Bannister announced his retirement from athletics. He returned to his role as a junior doctor and pursued a successful career in neurology. He became a knight in 1975.